【Free Lifetime Support 】Email:[email protected],Toll Free 1-888-959-9866.Safevant Wireless Security Camera System with 60-Day Money Back Guarantee,One Year Warranty and Free Life Time Tech Support.If miss your calling, please email us at [email protected], we will reply you asap since time differen. 【1TB Hard Drive】8CH 1080P NVR Security Camera System Wireless with 4pcs IP66 Weatherproof Bullet Indoors&Outdoors 960P Wireless Security Cameras, provide you Crystal Super Clear Image, Night Vison Up to 65ft/20M. Pre-installed 1TB HDD for video recording to protect your Home and Business 24/7. 【NOT Wire-free】Wireless Security System No need to Run Cables between Cameras and NVR.Just Plug the Security Camera System into Power Outlets with Provided Power Supply adapters (4*12V/1A for each Wireless IP Camera;1*12V/2A for NVR), and Connect NVR to PC/TV Monitor with VGA/HDMI Cable.True Plug and Play. 【Smart Remote Access】Wireless Camera System allows you Remote Access simultaneously at anytime, anywhere with wifi/4G on smart Phone,Pad and PC. Download IP Pro/IP Pro3 on mobile phone (Free App), super easy setup in seconds. Download CMS software on www.safevantcctv.com so that you can remote view Surveillance Camera System on PC or laptop. 【Motion Detection&Alerts】Home Security Camera System support motion recording and detection.When motion is detected, you will get Mobile Notification and Email alerts so that you will always get notice of what's happening.Motion recording starts when motion is detected and stops when motion detection is over. Kindly suggest to setup time recording and motion recording at the same time since motion recording last short time. Overview: All-in-One 8 1080P Channel Wireless Security Camera system.Support Multi-Alarm Triggered(Video Loss, Motion Detection) and Alarm Alert(Sound, Email, FTP etc). It is a DIY home system with easy configurations not only the connectivity between cameras and NVR, but also the external access to it, and this system gives much higher resolution and image quality than analog ones. NVR Features: 1. 8CH 1080P Wireless NVR Recorder 2. 3520D Processor and Embedded Linux Operating System 3. Support Android/IOS/PC Remote View 4. Networking Protocol: UPNP, SMTP, PPPOE, DHCP etc. 5. 1 SATA Port, 1TB HDD Included, Up to 4TB Each, 2 USB2.0 Port 6. Support Video Preview/Recording/Playback/USB Backup 7. Power Supply Input: DC12V-2A 8. Power Dissipation: ¨Q5W Camera Features: 1. Image Sensor: 1/4'' Color CMOS 2. Image Resolution: 1280*960P 3. Minimum Illumination: 0 Lux (IR On) 4. Night Vision: 65 Feet (20m) 5. Lens: 4mm Lens 6. Weatherproof: Yes 7. Power Supply Input: DC12V-1A 8. Power Dissipation: ¨Q6W Package: *8CH WIFI NVR x1 *960P Waterproof IP Cameras x4 *Power Supply (12V-1A) for Cameras (Cable Length: 10 Feet) x4 *Power Supply(12V-2A) for NVR (Cable Length: 3.3 Feet) x1 *Network Cable (Length: 3.3 Feet) x1 *Screw Bag x1 *Mouse x1 *User Manual x1 (You Need prepare a Monitor and a Router) 1 Year Warranty When Purchased from Safevant. Thanks for shopping from us. Any problems during using our device, pls do not hesitate to contact us. 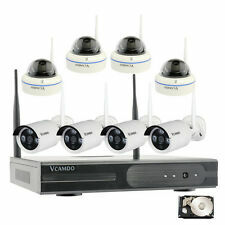 REAL P2P: Plug and play surveillance kit, camera and NVR are paired before shipping. Simply connect the cameras and NVR to the Power by included power adapter, picture shows up. NOTICE: Wireless means video cable is not required for camera's working, but device user still NEED to connect camera to Power outlet for 24/7 surveillance purpose..
HOW IT WORKS: Connect the cameras and NVR to the power, connect the Mouse to NVR. Connect PC/TV monitor to NVR with a VGA/HDMI Cable. Connect the Router LAN Port to NVR WAN Port with Network Cable Provided. Then, stable and stream video will be received by our professional Wifi signal transmission based on Auto Code Rate adjustment.. REMOTE MONITORING AND PLAYBACK: firstrend wireless security camera system is totally compatible for your mobile (Andriod and iOS System), tablet and PC. Free APP can be download to remote view and playback recordings (Please make sure NVR is connected to your router by Ethernet cable). It also support Sync-playback,Video Backup and Motion detection. 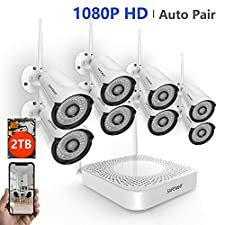 Email alert or App alert will be sent once motion got triggered (Noted: Please Set it Up Properly to Avoid Email Blast)..
HD SECURITY CAMERA SYSTEM: 8pcs of 1080P HD bullet cameras are provided in the package. Night Vision up to 65ft by 6 IR-leds and IP66 rated weatherproof cameras. You can install it anywhere you want, perfect outdoor/ indoor Security& Surveillance solution for Home, Office, Shop, Warehouse etc. firstrend CCTV System features 'One device linked One User ONLY'. The system kit is ONLY controlled by one authorized account, who can share the device with others in order to prevent attacking or hacking..
FAQ(Frequently Asked Question) of Firstrend Wireless Security System Q: What's your Warranty information and how to contact you? A: 60-day Free Return, 12-month Warranty Service. Both Email and Phone Support are available. Because of time difference and busy hotline, we may miss your call. Please don't worry, we'll call you back for sure. Or email us [email protected], we'll respond ASAP. Q: What's the log-in password? A: There's no log-in password as the Default Setting. Leave it back and simply click 'log-in' to next page. Q: How to create a password for my NVR System? What should I do when I forget my system password? A: After logging in--go to System Settings--User-- create Password Please keep your password in your mind, or it requires more effort to get it back. Please understand. If you forgot it, please Click 'Forgot Password', take two pictures of the serial number and your system date, send it to [email protected] We'll help you out. Q: What's the working temperature of Firstrend Security Camera? A: Camera working temperature: From -50 degree Fahrenheit to +122 degree Fahrenheit. Q: How to turn on Continuous Recordings (24 Hours, 7 Days)? A: On your monitor, right click your mouse, choose Manual Record in Menu page, select All, click Save. Q: Where should i playback recordings? A: Please right click the mouse--Playback. On Playback page, please select Date first on Calender, then, click 'Query' button. You'll see Color Timeline at bottom of the page, such as Purple Bars means motion detection recordings, Blue color means Normal Recordings. Double-click the color bars, it stats to playback automatically. 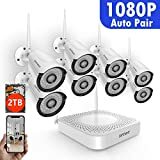 【2TB Hard Drive 】8CH 1080P NVR Security Camera System Wireless with 8pcs IP66 Weatherproof Bullet Indoors&Outdoors 1080P Wireless Security Cameras, provide you Crystal Super Clear Image, Night Vison Up to 65ft/20M. Pre-installed 2TB HDD for video recording to protect your Home and Business 24/7. 【NOT Wire-free】Wireless Surveillance Camera System No need to Run Cables between Cameras and NVR.Just Plug the Security Camera System into Power Outlets with Provided Power Supply adapters (8*12V/1A for each Wireless IP Camera;1*12V/2A for NVR), and Connect NVR to PC/TV Monitor with VGA/HDMI Cable.True Plug and Play. 【Smart Remote Access】Wireless Camera System allows you Remote Access simultaneously at anytime, anywhere with wifi/4G on smart Phone,Pad and PC. Scan QR Code or download IP Pro 3 on mobile phone (Free App), super easy setup in seconds. Install CMS software so that you can remote view Surveillance Camera System on PC or laptop. Overview: All-in-One 8 1080P Channel Wireless Security Camera system.Support Multi-Alarm Triggered(Video Loss, Motion Detection) and Alarm Alert(Sound, Email, FTP etc). It is a DIY home security system with easy configurations not only the connectivity between cameras and NVR, but also the external access to it, and this system gives much higher resolution and image quality than analog ones. NVR Features: 1. 8CH 1080P Wireless NVR Recorder 2. 3520D Processor and Embedded Linux Operating System 3. Support Android/IOS/PC Remote View 4. Networking Protocol: UPNP, SMTP, PPPOE, DHCP etc. 5. 1 SATA Port, 2TB HDD Included, Up to 4TB Each, 2 USB2.0 Port 6. Support Video Preview/Recording/Playback/USB Backup 7. Power Supply Input: DC12V-2A 8. Power Dissipation: ¨Q5W Camera Features: 1. Image Sensor: 1/4'' Color CMOS 2. Image Resolution: 1920*1080P 3. Minimum Illumination: 0 Lux (IR On) 4. Night Vision: 65 Feet (20m) 5. Lens: 4mm Lens 6. Weatherproof: Yes 7. Power Supply Input: DC12V-1A 8. Power Dissipation: ¨Q6W Package: *8CH WIFI NVR x1 *1080P Waterproof IP Cameras x8 *Power Supply (12V-1A) for Cameras (Cable Length: 10 Feet) x4 *Power Supply(12V-2A) for NVR (Cable Length: 3.3 Feet) x1 *Network Cable (Length: 3.3 Feet) x1 *Screw Bag x1 *Mouse x1 *User Manual x1 (You Need prepare a Monitor and a Router) 1 Year Warranty When Purchased from Safevant. Thanks for shopping from us. Any problems during using our device, pls do not hesitate to contact us. 【Free Lifetime Support】Email:[email protected],Toll Free 1-888-959-9866.Safevant Wireless Security Camera System with 60-Day Money Back Guarantee,One Year Warranty and Free Life-Time Tech Support.If miss your calling, please email us,we check email everyday. 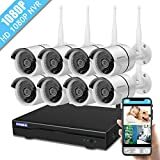 【2TB Hard Drive】8 Channel 1080P NVR Security Camera System Wireless with 8PCS IP66 Bullet Indoors&Outdoors 1080P Wireless Security Cameras, provide you Crystal Super Clear Image, Night Vison Up to 65ft/20M. 2TB HDD Pre-installed for Continuous Recording at Highest Resolution,protect your Home and Business 24/7. 【NOT Wire-free】Security Camera System No need to Run Cables between Cameras and NVR.Just Plug the Security Camera System into Power Outlets with Provided Power Supply adapters (4*12V/1A for each Wireless IP Camera;1*12V/2A for NVR), Connect NVR to PC/TV Monitor with VGA/HDMI Cable.True Plug and Play. 【Smart Remote Access】Wireless Camera System allows you Remote Access simultaneously at anytime, anywhere with wifi/4G on Smartphone,Pad and PC. Download IP Pro3 or Eseecloud3 on Smartphone (Free App), super easy setup in seconds.Install CMS software so that you can remote view Surveillance Camerart Phone,Pad and PC. Scan QR Code or download IP-Pro 3 on mobile phone (Free App), super easy setup in seconds. Install CMS software so that you can remote view Surveillance Camera System on PC or laptop. 【Motion Detection】Wireless Security System support motion detection and record.When motion is detected, you will get Mobile Notification so that you will always get notice of what's happening.Motion recording starts when motion is detected and stops when motion detection is over. Kindly suggest to setup time recording and motion recording at the same time since motion recording last short time. 【Free Lifetime Support】Email:[email protected],Toll Free 1-888-959-9866.Safevant Wireless Security Camera System with 60-Day Money Back Guarantee,One Year Warranty and Free Life Time Tech Support.If miss your calling, please email us at [email protected], we will reply you asap since time difference. 【NOT Wire-free】Wireless Security System No need to Run Cables between Cameras and NVR.Just Plug the Security Camera System into Power Outlets with Provided Power Supply adapters (8*12V/1A for each Wireless IP Camera;1*12V/2A for NVR), and Connect NVR to PC/TV Monitor with VGA/HDMI Cable.True Plug and Play. 【Smart Remote Access】Wireless Camera System allows you Remote Access simultaneously at anytime, anywhere with wifi/4G on smart Phone,Pad and PC. Scan QR Code or download IP Pro/IP Pro3 on mobile phone (Free App), super easy setup in seconds. Install CMS software so that you can remote view Surveillance Camera System on PC or laptop. 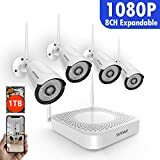 【1TB Hard Drive 】8CH 1080P NVR Security Camera System Wireless with 8pcs IP66 Weatherproof Bullet Indoors&Outdoors 960P Wireless Security Cameras, provide you Crystal Super Clear Image, Night Vison Up to 65ft/20M. Pre-installed 1TB HDD for video recording to protect your Home and Business 24/7. 【Easier Remote Access】Wireless Camera System allows you Remote Access simultaneously at anytime, anywhere with wifi/4G on smart Phone,Pad and PC. Download IP Pro/IP Pro3 on mobile phone (Free App), super easy setup in seconds. Install CMS software so that you can remote view Surveillance Camera System on PC or laptop. Overview: All-in-One 8 1080P Channel Wireless Security Camera system.Support Multi-Alarm Triggered(Video Loss, Motion Detection) and Alarm Alert(Sound, Email, FTP etc). It is a DIY home security system with easy configurations not only the connectivity between cameras and NVR, but also the external access to it, and this system gives much higher resolution and image quality than analog ones. NVR Features: 1. 8CH 1080P Wireless NVR Recorder 2. 3520D Processor and Embedded Linux Operating System 3. Support Android/IOS/PC Remote View 4. Networking Protocol: UPNP, SMTP, PPPOE, DHCP etc. 5. 1 SATA Port, 1TB HDD Included, Up to 4TB Each, 2 USB2.0 Port 6. Support Video Preview/Recording/Playback/USB Backup 7. Power Supply Input: DC12V-2A 8. Power Dissipation: ¨Q5W Camera Features: 1. Image Sensor: 1/4'' Color CMOS 2. Image Resolution: 1280*960P 3. Minimum Illumination: 0 Lux (IR On) 4. Night Vision: 65 Feet (20m) 5. Lens: 4mm Lens 6. Weatherproof: Yes 7. Power Supply Input: DC12V-1A 8. Power Dissipation: ¨Q6W Package: *8CH WIFI NVR x1 *960P Waterproof IP Cameras x8 *Power Supply (12V-1A) for Cameras (Cable Length: 10 Feet) x4 *Power Supply(12V-2A) for NVR (Cable Length: 3.3 Feet) x1 *Network Cable (Length: 3.3 Feet) x1 *Screw Bag x1 *Mouse x1 *User Manual x1 (You Need prepare a Monitor and a Router) 1 Year Warranty When Purchased from Safevant. Thanks for shopping from us. Any problems during using our device, pls do not hesitate to contact us. 【Free Lifetime Support 】Email:[email protected],Toll Free 1-888-959-9866.Safevant Wireless Security Camera System with 60-Day Money Back Guarantee,One Year Warranty and Free Life Time Tech Support.If miss your calling, please email us at [email protected], we will reply you asap since time difference. 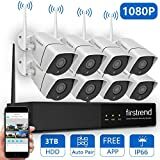 【1TB Hard Drive】8 Channel Security Camera System Wireless with 4PCS IP66 Weatherproof Bullet Indoors&Outdoors 960P Wireless Security Cameras, provide you Crystal Super Clear Image, Night Vison Up to 65ft/20M. 1TB HDD Pre-installed for Continuous Recording at Highest Resolution,protect your Home and Business 24/7. 【NOT Wire-free】Security Camera System No need to Run Cables between Cameras and NVR.Just Plug the Security Camera System into Power Outlets with Provided Power Supply adapters (4*12V/1A for each Wireless IP Camera;1*12V/2A for NVR), and Connect NVR to PC/TV Monitor with VGA/HDMI Cable.True Plug and Play. 【Smart Remote Access】Wireless Camera System allows you Remote Access simultaneously at anytime, anywhere with wifi/4G on smart Phone,Pad and PC. Scan QR Code or download IP-Pro(for IOS) and Eseenet+ (for Android) on mobile phone (Free App), super easy setup in seconds.Install CMS software so that you can remote view Surveillance Camera System on PC or laptop. 【Motion Detection&Alerts】Wireless Security System support motion recording and detection.When motion is detected, you will get Mobile Notification and Email alerts so that you will always get notice of what's happening.Motion recording starts when motion is detected and stops when motion detection is over. Kindly suggest to setup time recording and motion recording at the same time since motion recording last short time. 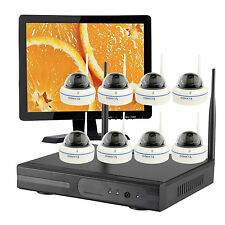 Overview: All-in-One 8 Channel Wireless Security system.Supports Multi-Alarm Triggered(Video Loss, Motion Detection) and Alarm Alert(Sound, Email, FTP etc). It is a DIY home system with easy configurations not only the connectivity between cameras and NVR, but also the external access to it, and this system gives much higher resolution and image quality than analog ones. NVR Features: 1. 8CH 960P Wireless NVR Recorder 2. 3520D Processor and Embedded Linux Operating System 3. Support Android/IOS/PC Remote View? 4. Networking Protocol: UPNP, SMTP, PPPOE, DHCP etc. 5. 1 SATA Port, 1TB HDD Included, Up to 4TB Each, 2 USB2.0 Port 6. Support Video Preview/Recording/Playback/USB Backup 7. Power Supply Input: DC12V-2A 8. Power Dissipation: ≦5W Camera Features: 1. Image Sensor: 1/4'' Color CMOS 2. Image Resolution: 1280*960P 3. Minimum Illumination: 0 Lux (IR On) 4. Night Vision: 65 Feet (20m) 5. Lens: 4mm Lens 6. Weatherproof: Yes 7. Power Supply Input: DC12V-1A 8. Power Dissipation: ≦6W Package: *8CH WIFI NVR(with 1TB HDD) x1 *960P Waterproof IP Cameras x4 *Power Supply (12V-1A) for Cameras (Cable Length: 10 Feet) x4 *Power Supply(12V-2A) for NVR (Cable Length: 3.3 Feet) x1 *HDMI Cable x1 *Network Cable (Length: 3.3 Feet) x1 *Screw Bag x1 *Mouse x1 *User Manual x1 (You Need prepare a Monitor and a Router) 2 Year Warranty When Purchased from Safevant. Thanks for shopping from us. Any problems during using our device, pls do not hesitate to contact us. 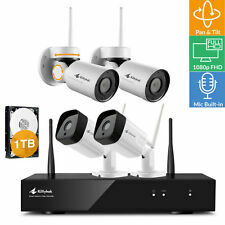 【Free Lifetime Support】Email:[email protected],Toll Free 18889599866.Safevant Wireless Security Camera System with 60-Day Money Back Guarantee,One Year Warranty and Free Life Time Tech Support.If miss your calling, please email us at [email protected], we will reply you asap since time difference. 【All in One with 12" Monitor】8CH 1080P NVR Security Camera System with 8pcs IP66 Weatherproof Bullet Indoors&Outdoors 1080P Wireless Security Cameras, provide you Crystal Super Clear Image, Night Vison Up to 65ft/20M. Pre-installed 2TB HDD for video recording to protect your Home and Business 24/7. 【Motion Detection&Alerts】Home Security Camera System supports motion recording and detection.When motion is detected, you will get Mobile Notification and Email alerts so that you will always get notice of what's happening.Motion recording starts when motion is detected and stops when motion detection is over. Kindly suggest to setup time recording and motion recording at the same time since motion recording last short time. Overview: All-in-One 8 1080P Channel Wireless Security Camera system.Support Multi-Alarm Triggered(Video Loss, Motion Detection) and Alarm Alert(Sound, Email, FTP etc). It is a DIY home system with easy configurations not only the connectivity between cameras and NVR, but also the external access to it, and this system gives much higher resolution and image quality than analog ones. NVR Features: 1. 8CH 1080P Wireless NVR Recorder 2. 3520D Processor and Embedded Linux Operating System 3. Support Android/IOS/PC Remote View 4. Networking Protocol: UPNP, SMTP, PPPOE, DHCP etc. 5. 1 SATA Port, 2TB HDD Included, Up to 4TB Each, 2 USB2.0 Port 6. Support Video Preview/Recording/Playback/USB Backup 7. Power Supply Input: DC12V-2A 8. Power Dissipation: ¨Q5W Camera Features: 1. Image Sensor: 1/4'' Color CMOS 2. Image Resolution: 1280*1080P 3. Minimum Illumination: 0 Lux (IR On) 4. Night Vision: 65 Feet (20m) 5. Lens: 4mm Lens 6. Weatherproof: Yes 7. Power Supply Input: DC12V-1A 8. Power Dissipation: ¨Q6W Package: *8CH WIFI NVR x1 *960P Waterproof IP Cameras x8 *Power Supply (12V-1A) for Cameras (Cable Length: 10 Feet) x8 *Power Supply(12V-2A) for NVR (Cable Length: 3.3 Feet) x1 *Network Cable (Length: 3.3 Feet) x1 *Screw Bag x1 *Mouse x1 *User Manual x1 (You Need prepare a Router) 1 Year Warranty When Purchased from Safevant. Thanks for shopping from us. Any problems during using our device, pls do not hesitate to contact us. 【1TB Hard Drive】8 Channel 1080P NVR Security Camera System Wireless with 4PCS IP66 Bullet Indoors&Outdoors 1080P Wireless Security Cameras, provide you Crystal Super Clear Image, Night Vison Up to 65ft/20M. 1TB HDD Pre-installed for Continuous Recording at Highest Resolution,protect your Home and Business 24/7. 【Smart Remote Access】Wireless Camera System allows you Remote Access simultaneously at anytime, anywhere with wifi/4G on Smartphone,Pad and PC. Download IP Pro3 or Eseecloud3 on Smartphone (Free App), super easy setup in seconds.Install CMS software so that you can remote view Surveillance Camera System on PC or laptop. 【Motion Detection】Wireless Security System support motion detection and record.When motion is detected, you will get Mobile Notification so that you will always get notice of what's happening.Motion recordinile Notification and Email alerts so that you will always get notice of what's happening.Motion recording starts when motion is detected and stops when motion detection is over. Kindly suggest to setup time recording and motion recording at the same time since motion recording last short time. 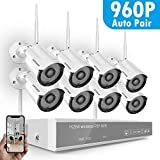 Overview: All-in-One 8 Channel Wireless Security Camera system.Supports Multi-Alarm Triggered(Video Loss, Motion Detection) and Alarm Alert(Sound, Email, FTP etc). It is a DIY security camera system with easy configurations not only the connectivity between cameras and NVR, but also the external access to it, and this system gives much higher resolution and image quality than analog ones. NVR Features: 1. 8CH 1080P Wireless NVR Recorder 2. 3520D Processor and Embedded Linux Operating System 3. Support Android/IOS/PC Remote View? 4. Networking Protocol: UPNP, SMTP, PPPOE, DHCP etc. 5. 1 SATA Port, 1TB HDD Included, Up to 4TB Each, 2 USB2.0 Port 6. Support Video Preview/Recording/Playback/USB Backup 7. Power Supply Input: DC12V-2A 8. Power Dissipation: ¨Q5W Camera Features: 1. Image Sensor: 1/4'' Color CMOS 2. Image Resolution: 1920*1080P 3. Minimum Illumination: 0 Lux (IR On) 4. Night Vision: 65 Feet (20m) 5. Lens: 4mm Lens 6. Weatherproof: Yes 7. Power Supply Input: DC12V-1A 8. Power Dissipation: ¨Q6W Package: *8CH WIFI NVR(with 1TB HDD) x1 *1080P Waterproof IP Cameras x4 *Power Supply (12V-1A) for Cameras (Cable Length: 10 Feet) x4 *Power Supply(12V-2A) for NVR (Cable Length: 3.3 Feet) x1 *HDMI Cable x1 *Network Cable (Length: 3.3 Feet) x1 *Screw Bag x1 *Mouse x1 *User Manual x1 (You Need prepare a Monitor and a Router) 1 Year Warranty When Purchased from Safevant. Thanks for shopping from us. Any problems during using our device, pls do not hesitate to contact us. 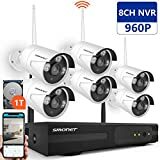 【All in One】8CH 1080P NVR&10.1"Monitor Security Camera System with 4pcs IP66 Weatherproof Bullet Indoors&Outdoors 960P Wireless Security Cameras, provide you Crystal Super Clear Image, Night Vison Up to 65ft/20M. Pre-installed 1TB HDD for video recording to protect your Home and Business 24/7. 【Smart Remote Access】Wireless Camera System allows you Remote Access simultaneously at anytime, anywhere with wifi/4G on smart Phone,Pad and PC. Scan QR Code or download IP-Pro3 on mobile phone (Free App), super easy setup in seconds. Install CMS software so that you can remote view Surveillance Camera System on PC or laptop. 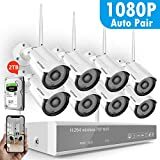 Overview: All-in-One 8 1080P Channel Wireless Security Camera system.Support Multi-Alarm Triggered(Video Loss, Motion Detection) and Alarm Alert(Sound, Email, FTP etc). It is a DIY home system with easy configurations not only the connectivity between cameras and NVR, but also the external access to it, and this system gives much higher resolution and image quality than analog ones. NVR Features: 1. 8CH 1080P Wireless NVR Recorder 2. 3520D Processor and Embedded Linux Operating System 3. Support Android/IOS/PC Remote View 4. Networking Protocol: UPNP, SMTP, PPPOE, DHCP etc. 5. 1 SATA Port, 1TB HDD Included, Up to 4TB Each, 2 USB2.0 Port 6. Support Video Preview/Recording/Playback/USB Backup 7. Power Supply Input: DC12V-2A 8. Power Dissipation: ¨Q5W Camera Features: 1. Image Sensor: 1/4'' Color CMOS 2. Image Resolution: 1920*1080P 3. Minimum Illumination: 0 Lux (IR On) 4. Night Vision: 65 Feet (20m) 5. Lens: 4mm Lens 6. Weatherproof: Yes 7. Power Supply Input: DC12V-1A 8. Power Dissipation: ¨Q6W Package: *4CH WIFI NVR x1 *1080P Waterproof IP Cameras x4 *Power Supply (12V-1A) for Cameras (Cable Length: 10 Feet) x4 *Power Supply(12V-2A) for NVR (Cable Length: 3.3 Feet) x1 *Network Cable (Length: 3.3 Feet) x1 *Screw Bag x1 *Mouse x1 *User Manual x1 (You Need prepare a Router) 1 Year Warranty When Purchased from Safevant. Thanks for shopping from us. Any problems during using our device, pls do not hesitate to contact us. 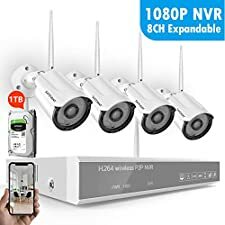 【NO Hard Drive 】8CH 1080P NVR Security Camera System with 8pcs IP66 Weatherproof Bullet Indoors&Outdoors 960P Wireless Security Cameras, provide you Crystal Super Clear Image, Night Vison Up to 65ft/20M. Need purchase 3.5inch SATA interface HDD for video recording to protect your Home and Business 24/7. 【NOT Wire-free】Wireless Video Security System No need to Run Cables between Cameras and NVR.Just Plug the Security Camera System into Power Outlets with Provided Power Supply adapters (8*12V/1A for each Wireless IP Camera;1*12V/2A for NVR), and Connect NVR to PC/TV Monitor with VGA/HDMI Cable.True Plug and Play. 【Smart Remote Access】Wireless Camera System allows you Remote Access simultaneously at anytime, anywhere with wifi/4G on smart Phone,Pad and PC. Download IP Pro/IP Pro3 on mobile phone (Free App), super easy setup in seconds. Install CMS software so that you can remote view Surveillance Camera System on PC or laptop. Overview: All-in-One 8 1080P Channel Wireless Security Camera system.Support Multi-Alarm Triggered(Video Loss, Motion Detection) and Alarm Alert(Sound, Email, FTP etc). It is a DIY home system with easy configurations not only the connectivity between cameras and NVR, but also the external access to it, and this system gives much higher resolution and image quality than analog ones. NVR Features: 1. 8CH 1080P Wireless NVR Recorder 2. 3520D Processor and Embedded Linux Operating System 3. Support Android/IOS/PC Remote View 4. Networking Protocol: UPNP, SMTP, PPPOE, DHCP etc. 5. 1 SATA Port, NO HDD Included, Up to 4TB Each, 2 USB2.0 Port 6. Support Video Preview/Recording/Playback/USB Backup 7. Power Supply Input: DC12V-2A 8. Power Dissipation: ¨Q5W Camera Features: 1. Image Sensor: 1/4'' Color CMOS 2. Image Resolution: 1280*960P 3. Minimum Illumination: 0 Lux (IR On) 4. Night Vision: 65 Feet (20m) 5. Lens: 4mm Lens 6. Weatherproof: Yes 7. Power Supply Input: DC12V-1A 8. Power Dissipation: ¨Q6W Package: *8CH WIFI NVR x1 *960P Waterproof IP Cameras x8 *Power Supply (12V-1A) for Cameras (Cable Length: 10 Feet) x4 *Power Supply(12V-2A) for NVR (Cable Length: 3.3 Feet) x1 *Network Cable (Length: 3.3 Feet) x1 *Screw Bag x1 *Mouse x1 *User Manual x1 (You Need prepare a Monitor and a Router) 1 Year Warranty When Purchased from Safevant. Thanks for shopping from us. Any problems during using our device, pls do not hesitate to contact us. 【NOT Wire-free】Home Security Camera System No need to Run Cables between Cameras and NVR.Just Plug the Security Camera System into Power Outlets with Provided Power Supply adapters (8*12V/1A for each Wireless IP Camera;1*12V/2A for NVR), and Connect NVR to PC/TV Monitor with VGA/HDMI Cable.True Plug and Play. 【2TB Hard Drive】8 Channel 1080P NVR Security Camera System Wireless with 8PCS IP66 Bullet Indoors&Outdoors 960P Wireless Security Cameras, provide you Crystal Super Clear Image, Night Vison Up to 65ft/20M. 2TB HDD Pre-installed for Continuous Recording at Highest Resolution,protect yourOutdoors 960P Wireless Security Cameras, provide you Crystal Super Clear Image, Night Vison Up to 65ft/20M. 2TB HDD Pre-installed for Continuous Recording at Highest Resolution,protect your Home and Business 24/7. 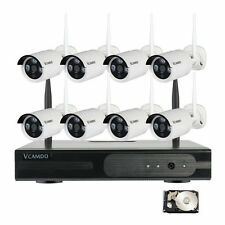 Overview: All-in-One 8 Channel Wireless Security Camera system.Supports Multi-Alarm Triggered(Video Loss, Motion Detection) and Alarm Alert(Sound, Email, FTP etc). It is a DIY home system with easy configurations not only the connectivity between cameras and NVR, but also the external access to it, and this system gives much higher resolution and image quality than analog ones. NVR Features: 1. 8CH 960P Wireless NVR Recorder 2. 3520D Processor and Embedded Linux Operating System 3. Support Android/IOS/PC Remote View 4. Networking Protocol: UPNP, SMTP, PPPOE, DHCP etc. 5. 1 SATA Port, 2 TB HDD Included, Up to 4TB Each, 2 USB2.0 Port 6. Support Video Preview/Recording/Playback/USB Backup 7. Power Supply Input: DC12V-2A 8. Power Dissipation: ¨Q5W Camera Features: 1. Image Sensor: 1/4'' Color CMOS 2. Image Resolution: 1280*960P 3. Minimum Illumination: 0 Lux (IR On) 4. Night Vision: 65 Feet (20m) 5. Lens: 4mm Lens 6. Weatherproof: Yes 7. Power Supply Input: DC12V-1A 8. Power Dissipation: ¨Q6W Package: *8CH WIFI NVR(with 2TB HDD) x1 *960P Waterproof IP Cameras x8 *Power Supply (12V-1A) for Cameras (Cable Length: 10 Feet) x8 *Power Supply(12V-2A) for NVR (Cable Length: 3.3 Feet) x1 *HDMI Cable x1 *Network Cable (Length: 3.3 Feet) x1 *Screw Bag x1 *Mouse x1 *User Manual x1 (You Need prepare a Monitor and a Router) 1 Year Warranty When Purchased from Safevant. Thanks for shopping from us. Any problems during using our device, pls do not hesitate to contact us. 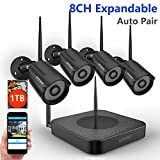 8 Channel 960P Wireless Security Camera System(8CH NVR + 6 Cams) for Villa, Home, Office, Shop, Warehouse or elsewhere(Indoor/ Outdoor). 1TB Hard Drive Pre-installed. Please Note that this is not Battery Powered Cameras. Wireless Camera System Doesn't Mean You can Use it without Any Cables. Power Supply still Needed to Power on the Cameras and NVR (Smonet doesn't Take Charge of Installation). Powered by Stable Power from nearby Outlets, 24x7 hours Live Surveillance..
Wireless Video Security System is Easy to Setup and DIY Installation without any Video Cables. True Plug and Play. Connect the NVR and Cameras with Power Supply Provided. Connect the Mouse to NVR. Connect PC/TV monitor to NVR with a VGA/HDMI Cable. Connect the Router LAN Port to NVR WAN Port with Network Cable Provided. The Video will Show Up. The System builds a more Powerful Wireless Signal Coverage and Make the Connection Quick and Easy. Working without Disturbing your Regular Internet Speed..
Wireless Surveillance Camera System Allows you to View the Live Video Remotely Anytime and Anywhere by Phone and Pad(Available for Android & IOS system, not Windows Users). Download Free APP "IP PRO" or "Eseecloud" from Android Google Play or Apple APP Store. Register an New Account, then Add Device ID. You can View the Video by WiFi or 2G/3G/4G Network. PC/Laptop View: Windows System: CMS Software. MAC system: MAC CMS Software. (Please Send E-mail to Smonet for Software). Wireless IP Camera System Supports Sync-playback, Video Backup and Video detection. You can Receive Email Alerts upon Motion Detection or App Alert When Set it Up (Noted: Please Set it Up Properly to Avoid Email Blast). Simply Record and Playback On Your Mobile Devices. Seamlessly Stream Video Directly to your Smartphone, Tablet and PC. Keep an Eye on Your Belongings Anywhere and Anytime.Night Vision: 65ft (20m). Getting a Crystal Clear Picture, Even in Total Darkness. IP66 Weatherproof Cameras..
Expandable System: Support Up to 8pcs Cameras. Only Compared with SMONET 960P IP Camera. Camera ASIN Code is B01IR4TVGO. If need, Search B01IR4TVGO. 1 Year Warranty and Lifetime Free Technical Support. Provide Free Brand-new Parts for Replacement. Provide Free 10db Antenna and 10/16/30 Feet Power Extension Cable. US Toll Free: 1-866-678-0666(Available after 5:00 PM at Pacific Time)..
Overview: 1. Suitable for Home and Small Project Which Help You Record, Playback and Remote. 2. This All-in-One 8 Channel NVR Kit Allows 6Pcs Outdoor 960P Cameras to Connect and Set Up in Just Minutes. No Need Wires Anymore, No Exposed Lines Anymore, More Beautiful, More Hidden, More Safely. 3. Strong Anti-Interference and 65ft Night Vision, 1280*960 Image Sensor Makes More Clear and Stunning Picture and Video. 4. Supports Multi-Alarm Triggered(Video Loss, Motion Detection) and Alarm Alert(Sound, Email, FTP etc). 5. View the Video on the Mobile App from Anytime and Anywhere. Very Convenient. NVR Features: 1. 6CH 960P Wireless NVR Recorder 2. 3520D Processor and Embedded Linux Operating System 3. Support Video Preview/Recording/Playback/USB Backup 4. Support Android/IOS/PC Remote View 5. Networking Protocol: UPNP, SMTP, PPPOE, DHCP etc. 6. 1 SATA Port, 1TB HDD Included, Up to 4TB Each, 2 USB2.0 Port 7. Power Supply Input: DC12V-2A 8. Power Dissipation: ≦5W Camera Features: 1. Image Sensor: 1/4'' Color CMOS 2. Image Resolution: 1280*960P 3. Lens: 4mm Lens 4. Night Vision: 65Ft (20m) 5. Minimum Illumination: 0 Lux (IR On) 6. Weatherproof: Yes 7. Power Supply Input: DC12V-1A 8. Power Dissipation: ≦6W Package: *6CH WIFI NVR(with 1TB HDD) x1 *960P Waterproof IP Cameras x6 *Power Supply (12V-1A) for Cameras (Cable Length: 10 Feet) x6 *Power Supply(12V-2A) for NVR (Cable Length: 3.3 Feet) x1 *Network Cable (Length: 3.3 Feet) x1 *Mouse x1 *User Manual x1 *Screw Bag x1 (You Need to Buy a Monitor, a VGA or HDMI Cable and a Router) Welcome to Enter Into Our Shop and Enjoy Your Wonderful Shopping! 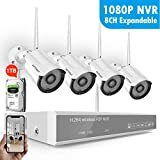 【NO Hard Drive】4CH 1080P NVR&Monitor -12 Inch Security Camera System with 4pcs IP66 Weatherproof Bullet Indoors&Outdoors 960P Wireless Security Cameras, provide you Crystal Super Clear Image, Night Vison Up to 65ft/20M. Need purchase 3.5inch SATA interface HDD for video recording to protect your Home and Business 24/7. Overview: All-in-One 4 1080P Channel Wireless Security Camera system.Support Multi-Alarm Triggered(Video Loss, Motion Detection) and Alarm Alert(Sound, Email, FTP etc). It is a DIY home system with easy configurations not only the connectivity between cameras and NVR, but also the external access to it, and this system gives much higher resolution and image quality than analog ones. NVR Features: 1. 8CH 1080P Wireless NVR Recorder 2. 3520D Processor and Embedded Linux Operating System 3. Support Android/IOS/PC Remote View 4. Networking Protocol: UPNP, SMTP, PPPOE, DHCP etc. 5. 1 SATA Port, NO HDD Included, Up to 4TB Each, 2 USB2.0 Port 6. Support Video Preview/Recording/Playback/USB Backup 7. Power Supply Input: DC12V-2A 8. Power Dissipation: ¨Q5W Camera Features: 1. Image Sensor: 1/4'' Color CMOS 2. Image Resolution: 1280*960P 3. Minimum Illumination: 0 Lux (IR On) 4. Night Vision: 65 Feet (20m) 5. Lens: 4mm Lens 6. Weatherproof: Yes 7. Power Supply Input: DC12V-1A 8. Power Dissipation: ¨Q6W Package: *4CH WIFI NVR x1 *960P Waterproof IP Cameras x4 *Power Supply (12V-1A) for Cameras (Cable Length: 10 Feet) x4 *Power Supply(12V-2A) for NVR (Cable Length: 3.3 Feet) x1 *Network Cable (Length: 3.3 Feet) x1 *Screw Bag x1 *Mouse x1 *User Manual x1 (You Need prepare a Router) 1 Year Warranty When Purchased from Safevant. Thanks for shopping from us. Any problems during using our device, pls do not hesitate to contact us. 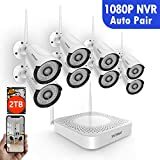 【2019 New】 Wireless Security Camera System,OHWOAI 1080P NVR 8Pcs 1080P Home Surveillance IP Cameras,HD Outdoor Indoor Weatherproof Security Cameras, Wireless CCTV System No Hard Drive. 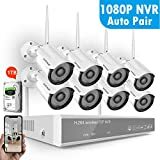 ✔【Full HD Weatherproof & Night Vision Cameras】3.6mm lens & automatic IR-cut filter IP cameras up to 65ft night vision,provide a sharp,clear and crisp image all day and night. IP-66 weatherproof camera can be used for outdoors and indoors like home,office,shop,warehouse,restaurant etc..
✔【Easy To Set Up /Wireless】Wireless security camera system is Plug&play surveillance system.It's very easy to set up,just connect the NVR and cameras with power supply Provided. Connect the Mouse and PC/TV monitor to NVR,the Router LAN Port to NVR WAN Port with Network Cable Provided..
✔【Customized Motion Detection & Easy Remote Access】System supports motion detected record & alarm and allows you to access it remotely from your smart phone,tablet and PC anytime,anywhere.You can customize your detection plan.When an action is been detected,the system will send you an email alert so you can always see what's happening..
✔【8CH Expandable Camera System & Other Accessories】This security system includes full HD 8CH 1080P NVR+8Pcs 1080P IP Cameras.You can add or increase extended cameras as you like.We also provide accessories of the system(extended antenna,Wi-Fi extender,expanded Camera,etc).It provides you the flexibility to extend additional accessories..
✔【Warranty & After-Sales Service】We offer 1-year warranty,free refund within 30 days.If have any problems,pls mail to [email protected],we will reply in 24 hours.Or pls call us: Tel:+1(352)321-2450 (Eastern time Monday-Friday 9:00am-5:00pm)..
★Do It Yourself ! Set Up the Whole System in 2 Minutes! Supports Mobile: Android 4.0 up/ iOS 7 up. ★HDMI Output + 720P HD --- View Megapixel Video on HD TV or Monitor!. ★New Tech Enables 500GB Hard Drive to Do Intelligent Recording Up to 30 Days!. ★Free App for Live View & Motion Alerts on Smart Devices with WiFi or 2G/3G/4G Anywhere Anytime!. ★2 Year Free Warranty + 60 Days Return, Lifetime Technical Support!. With Smart Link, You Can Set Up the Whole System in Minutes New Smartlink wireless setup technology allows you to set up your system in minutes. There is no manual configuration necessary. Smartlink automatically sets up communication between your system and your smartphone. 1.Power on your NVR & Cameras, and connect the NVR to your WiFi router. 2.Download the mobile app Meshare and log in with free account. 3.Follow the brief in-app instructions to set it up. Cover Your Entire Home with Strong WiFi Range Whether it's the front porch, your driveway, or your backdoor, the enhanced WiFi technology allows you to place the cameras anywhere, indoors or out with a wireless distance in an open area up to 170m (550ft). Vivid 720P HD Video Day or Night Our true HD cameras are exceptionally smooth, providing detail and color that are so vivid you'll feel like you never left.It helps get sharper pictures and videos,capture more details in a larger area Motion Dection Made Easy You can't always be watching your video feed,so let your Funlux smart wiless IP camera system send you a screenshot alert when your cameras detect motion Remote Viewing Anywhere Anytime You can view the cameras remotely on your smart phone, ipad or PC anywhere anytime once the system is set up. 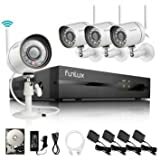 Package Includes 1) 4 Channel Security NVR 1) 500GB Hard Drive(Pre-installed in the NVR) 4) 720P Bullet IP Network Camera 1) 19V 3A Power Adapter 1) 1M(3ft) CAT5e Network Cable 4) 12V 1A Power Adapter for Cameras 1) Quick User Guide Please note that this system doesn't include a mouse. Customers need to buy one separately if needed.